Fasnap® Corp. is committed to quality, becoming ISO9002/ QS9000 registered in 1998, ISO 9001:2000 certified in 2005, ISO 9001: 2008 certified in 2011, and subsequently ISO 9001: 2015 certified in 2018. Fasnap® has redefined performance standards for timely delivery by maintaining superior inventory levels and shipping 99 percent of orders on a same-day basis. At Fasnap®, we are accountable for the delivery of our Products and Services "Right the First Time, On Time, Every Time". We will satisfy customers, comply with customers, statutory and regulatory requirements and continually improve our capabilities, processes and system. Fasnap® Corp. warrants that the products we sell are free from manufacturing defects. We will be pleased to assist customers in the selection or development of products and equipment for their specific application. We will provide working samples where feasible, however, the final choice is the responsibility of the customer. 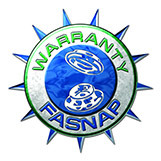 Fasnap® Corp., supports a LIMITED LIFETIME WARRANTY on its Premium Brands of Snap Fasteners and Grommets. This warranty provides the assurance that our premium brand fasteners, when properly installed and maintained, used in normal applications and under normal environmental conditions, are free from defect. Should these Premium Fasteners ever fail, Fasnap® Corp. will provide the original purchaser free replacement of the fastener. This warranty is limited to the original customer of Fasnap® Corp. or Fasnap’s authorized distributor and applies only to the Premium brands that Fasnap® Corp. offers to our customers. This warranty does not apply to products that fail due to improper installation or inadequate application design. This warranty is voided should these Premium Brand Products be combined with any other fasteners not covered by this warranty. Fasnap® Corp. reserves the right to inspect any product or application submitted for claim, and approve claims there of.